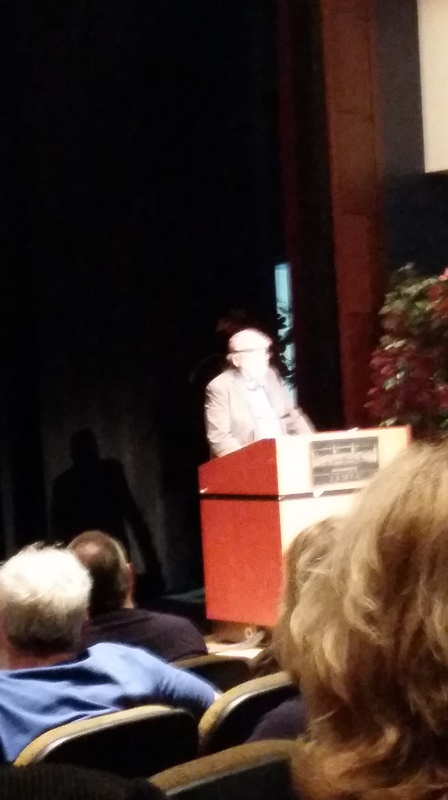 I’ve just come from a reading by one of my literary heroes – Richard Bausch – and honestly, I had several hesitations over going. I’d lose writing time, I wouldn’t be able to find the lecture hall (actual worry) and I’d be surrounded by people in a large hall – not my idea of a good time. I even talked myself out of going, arguing that I could catch him the next time he rolled into town. But I went. And I’m so glad that I did. Because it was worth it. So very worth it. After thirty minutes of reading one of his new short stories, it was already over. Time for the obligated students to leave and the rest of us to wait in line patiently. I didn’t realize so many people were willing to stay. To get an autograph from the author of their school- assigned books. But there were many like me, who came because they really wanted to, because they understood what a rare treat this would be. Batman stood next to me. He’d been a champ the entire time. Wanting to be at home playing Far Cry or Halo or some highly-aggressive videogame, he stuck by me, held my hand and sat through a reading I’m sure he had absolutely no interest in. And waiting in line, he held the book I’d purchased for a subsequent signature. The first I would be getting in the original school text where I first read Mr. Bausch’s work. When my time finally came, I set the text in front of him and quickly explained it was the book where I’d read “What Feels like the World.” He started to scribble his name and, knowing my time was running out, I quickly explained how important he was to me and my writing aspirations. And then I told him I followed his ten commandments. At this he stopped and looked up, recognition in his eyes. I did. 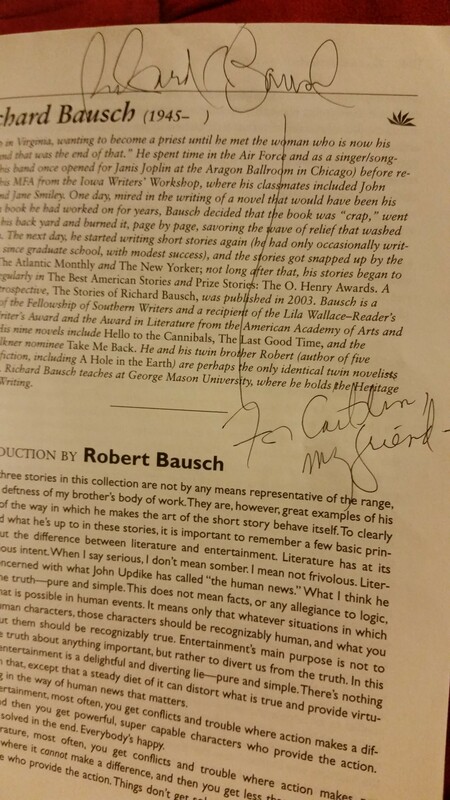 In an email a week ago, I’d confessed how influential he was to me and mentioned that I followed his set of rules “Richard Bausch’s ten commandments” for writers. I’m not sure too many people know of them, or even follow them (though they should), but this sparked genuine gratitude in his eyes. In an instant, he knew who I was, that I’d written to him. So I confirmed it. “Come here,” he said, then proceeded to open his arms to a hug. A hug! A hug from Richard Bausch! One of my literary heroes! Already fighting back tears, he looked me in the eye and told me how much my letter had meant to him, how he read it aloud to his wife and how it was one of the kindest letters he’d ever received. That’s when I started crying, because someone so important to me was moved by something I wrote. I get it. Richard Bausch says I get it. Writing has so many difficult days. Often they’re filled with doubt and fear and resentment for wanting something so far-fetched and having no choice but to be foolish enough to go for it. But then, days like today come along. Where it’s worth that effort. And pain. When hugs from heroes make all the difference and a simple signature with a few words give just one more push to keep going. Not the greatest picture. Batman did his best. Thank you for taking the time to read this email. I will try to make this quick and to the point. I first read your work in a short story class I took at Florida State University, where I studied for and graduated with a degree in Creative Writing. In general, I prefer novels. They’re a longer love affair and I never understood the attraction to one or two sets of events that do what a novel can in fifteen or twenty. I’m not sure what I expected to obtain from the class other than additional insight and a teacher recommendation – what I needed to get into an advanced writing workshop. I remember thinking I understood. What you were trying to say, how you were trying to say it, and I knew I wanted to do the same. Write the same. I want to be a successful novelist. The dream is to support myself financially, but I’m finding it’s not as easy as I’d hoped. I’m not opposed to hard work. Hard work strengthens. It trains. And that’s exactly what’s needed to achieve goals. That, and the willingness to struggle. And I’m doing both. I currently (and for the past five years since graduating) have maintained a steady 8-5 job while writing in the evenings. One to two hours. Sometimes three. I write the majority of the weekend and have (especially more recently) given up social outings to stay in and work. I’m always working. Always. I’ve become somewhat of a recluse but I can’t shake the habit. I feel uncomfortable, nervous, anxious when I don’t write. I think this is a good thing. Recently, I’ve considered returning to school. Maybe I should learn a more practical trade, something to bide my time until my work can generate an income. But when I research graduate degrees, I inevitably check for MFA programs. Creative Writing. What kind of classes are they offering? I’ve even looked into attending Chapman University, for the sole reason that you teach there and in addition to teaching writing, you teach the writing life. This may be something I need to learn. It’s long past due that I confess how very influential and important you’ve been to my writing and my writing practices, and of course, how thankful I am for the reading assignment all those years ago. Ironically, you came to read some of your work before I had the pleasure of devouring “What Feels Like the World.” As I didn’t know who you were at the time, I felt no deprivation in securing myself a comfortable seat in the back, where only parts of your words reached me. I have, since then, kicked myself for choosing so poorly. As it happens, I’ve been researching more MFA programs and having previously been taught by S. K., noticed he is now the Program Director at the University of *****, where I live. In my serious consideration of attending Chapman University, I’ve considered reaching out to him, in hopes of establishing a temporary fostering writing relationship. I need two letters of recommendation and have not had many read my work, not those that could offer a valuable, professional opinion on it. In my research though, I discovered you would be here, next week, January 14th at the Reeves theatre. I cannot describe my elation at that discovery! 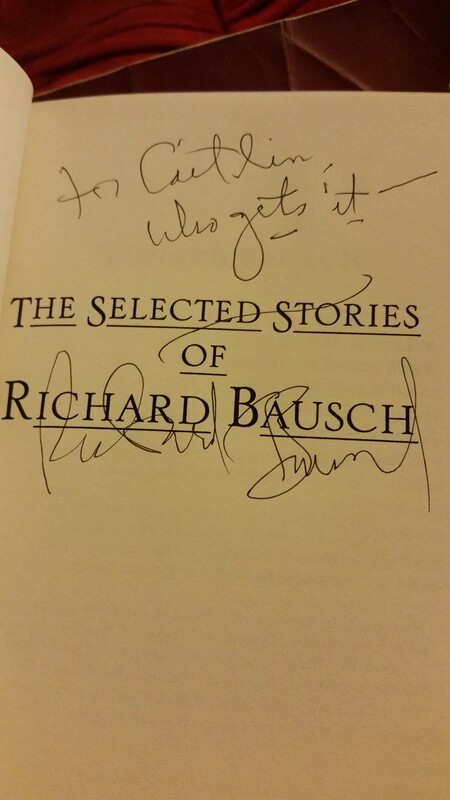 Mr. Bausch, I’m sure I’m doing a poor job at explaining how I feel about your work and what it’s done for me. I’m extremely uncomfortable in large, social settings, especially with others of great talent like yourself. I find more comfort in my recliner with the laptop open. For you though, I’m willing to brave the journey out into the world. And as far as seating arrangements, I promise, I won’t choose so poorly again. Caitlin, my eyes welled with tears when I read this! I’m so happy for you. Hang in there; the universe WILL know your genius and your heart someday. Thanks, Leeny. It was totally surreal seeing him. I actually started to shake. Caitlin – I was also very touched by reading this entry, I know how important writing is to you and you explain it so well. I hope you keep on with your writing, someday you will be discovered by someone who can help you become successful, I just know it! It’s taken many writers years and years of trying until they finally “make it”, and can make a living by writing. Yes, some are lucky and get published quickly, but most just plug away like you do. Don’t give up your dream, but if going back to school will help you, then I hope you get to do that. Going back to school would be great, but then I’d have a master’s degree in a field I couldn’t get a career in when I had a BA. But I could be in the right environment for a change and put off some my debt some more. And both of those sound like a win. It’s difficult. But it’s worth it. you had already relayed the story to me. Yet it still brought tears to my eyes. When you step outside your comfort zone, you find MAGIC. And you never know how a magical event can transform into a series of magical events. Now you know the secret.